Ghost Cowboy is about real tales from the 19th-century American frontier, when the Old West was young. Most of the posts here are actual news items from the 1800s and early 1900s. We'll be adding "new" content every week. Travel with us and sign up for an account, and you'll be able to leave comments and post in our forums. Your trailmasters, Ken in Alabama and Dave in Virginia, don't get to saddle up and vacation out west as often as they'd like, so they started this site. Drop us a note. COWBOYS GET THE WORST OF IT. Submitted by ken on January 22, 2007 - 1:56pm. DURANGO, Col., Jan. 30 - The mail carrier from Farmington, New-Mexico, reports that a protracted fight recently occurred between Carlisle cowboys and some Mexican sheep herders on the Lower San Juan River, near the Navajo Reservation. The trouble grew out of an effort of both parties to occupy the same range. The sheep herders drove their flocks where the cattle were feeding, and the cowboys attempted to drive them off. The Mexicans proved too strong for their assailants, and forced them to take refuge in a cabin. They then burned all the other buildings belonging to the cowboys, and held the latter as prisoners in the cabin for two days, during which time they drove away their sheep and then left. One Mexican was killed during the shooting. Submitted by ken on January 21, 2007 - 5:27pm. 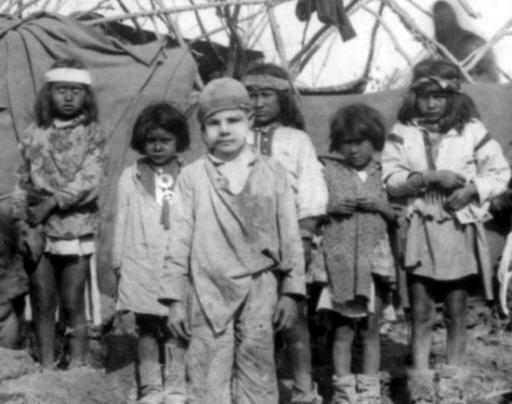 Captive White Boy: The captive white boy, Santiago McKinn, poses with a group of children in Geronimo's Camp. This photo is a detail from a larger image. Behind him is a partially constructed tent. The photo by Camillus Sidney Fly was taken in 1886 shortly before Geronimo's surrender to General George Crook on March 27, 1886. McKinn was taken from his home near Mimbres in the New Mexico Territory in 1885 by Chiricahua Apaches. McKinn assimilated with the Apaches during his captivity -- even learning their language -- and cried when he was returned to his family. Submitted by dave on January 20, 2007 - 4:10pm. 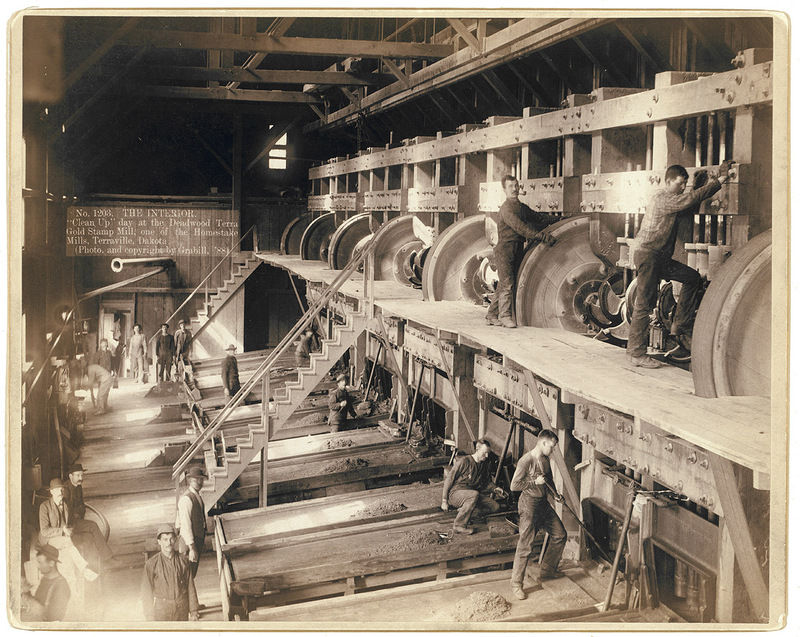 "Clean Up Day" at the Deadwood Terra Gold Stamp Mill near Terraville in the Dakota Territory. Ore fed into the mill is stamped, or crushed, to prepare it for the chemical extraction of gold. Photograph by John C.H. Grabill. Larger. BURIED IN A SNOW SLIDE. Submitted by ken on January 20, 2007 - 11:56am. Durango, Col., Jan. 26. -- Another snow slide tragedy is reported from the extreme southwestern part of the State. Leonard Sutton, who has been at work in the Silver Lake basin in the La Plata Mountains, reached Durango last night with the account of a slide which wrecked the cabin at the Daylight mine on Tuesday last. While he was sitting in the cabin with Henry Thomas, his partner, a fierce storm raging outside, a slide from the mountain side struck the building and demolished it. Sutton says he was hurled some distance and buried 15 feet under the snow. He managed to dig himself out and set about to discover Thomas, whom he found buried about 10 feet deep, with his leg broken and injured otherwise so badly that he could not sit up. Thomas begged Sutton to kill him and put him out of his misery. Sutton refused to do this, and then Thomas begged him to leave at once and save himself. Believing Thomas would not live more than a few minutes, he finally consented to leave him to his fate. Before his departure Thomas requested him to return in the Spring and bury his body, and send his money and other property to his sister, Miss Hannah Thomas, who resides in New-York.